Pat Buchanan is one of the country's most famous conservatives. 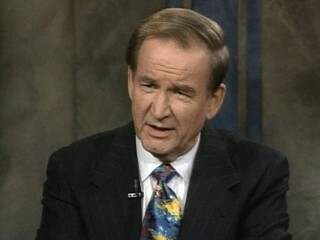 Buchanan writes books and articles and appears on television to express his extreme conservative views on the issues that he believes are important to the future of the United States. Buchanan was a senior adviser to American Presidents Richard Nixon, Gerald Ford, and Ronald Reagan, and was an original host on CNN's Crossfire. He sought the Republican presidential nomination in 1992 and 1996. He ran on the Reform Party ticket in the 2000 presidential election. He also co-founded The American Conservative magazine and launched a foundation named The American Cause.